It’s such a dramatic title, isn’t it? 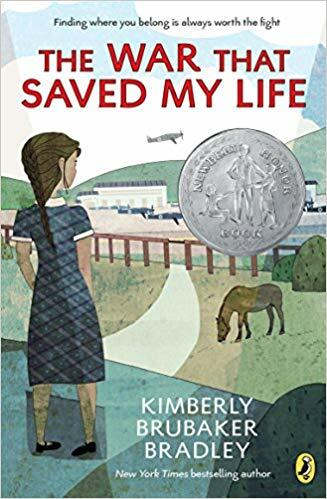 The war that saved my life by Kimberly Brubaker Bradley is a middle-grade book for 10-12 year-olds, and is a Newbery Honor book. Miss 11 read it a while ago and has told me many times that I needed to prioritise it because I would ‘just love it’ and she was absolutely right. Ada, the nine-year-old protagonist, lives with her mother and younger brother, Jamie, in a single room above a pub in London. It’s 1939, and children are being evacuated due to concerns about the Germans bombing London. Ada’s mother is absolutely horrible to Ada – mainly because she has a club foot. Ada isn’t allowed to leave their room and she’s miserable while Jamie is at school. Ada decides to teach herself to walk, despite great pain. This means she can escape with Jamie early one morning on the day the children at Jamie’s school are evacuated to the country. Ada and Jamie are the last children to be billeted out, possibly because of their dirtiness and Ada’s cross demeanour. They are taken to Susan’s house, a single lady who is still mourning the loss of her best friend, Becky. At Susan’s house, Ada finds out that her twisted foot could have been fixed with an operation when she was a baby. This gives her another reason to hate her mother. While life with Susan has its difficulties, Ada makes new friends, watches for German spies, learns to ride a pony and most importantly, begins to trust Susan. Miss 11 enjoyed learning about the war – references to Germans and ration cards and blackouts are skilfully woven into the story so that all the historical facts are integral to the story, rather than artificially thrown in. ‘Ada! Get back from that window!’ Mam’s voice, shouting. Mam’s arm, grabbing mine, yanking me so I toppled off my chair and fell hard to the floor. ‘I was only saying hello to Stephen White.’ I knew better than to talk back, but sometimes my mouth was faster than my brain. I’d become a fighter that summer. ‘Jamie’s out there,’ I mumbled. Wouldn’t you read on, too? We have a strong, feisty protagonist who has become a fighter, maybe because of her bad leg and is struggling against the antagonist, her mother. There is a sequel, The war I finally won. When you enjoy a book so much, it’s wonderful to know that there is an equally enjoyable sequel. It’s a great book, Pam. Put it straight on my ‘To Read’ list. You and B should definitely read it, Renee. This sounds like the sort of book my girl would have liked when she was younger. It’s a wonderful way for start to educate young readers about history.